While viewing a product, if you click the picture or "details" button the product will open in its own page with a larger picture and more details on the product (if they are availible). On the top menu bar there is a search feature. Its a very powerful tool on this site. Put in any part or a part number or part of a description and it will find it. This is great for little obscure things that you may not know which category we may have listed them in. Its not required to register, but If you add items in your cart and then login the items in the cart will be lost. So login first. Please register and login to your account before adding any items to your cart. We have 99% of everything on this site that's listed as instock. If you add something to your shipping cart and do not purchase that item, it will be removed from your cart in 1 hour. After that time someone else may purchase that item. If you are interested in an out of stock item. First login to your account. View that item and click "Watch List" button. When we relist that item as back in stock you will receiver an email that its back instock. This only works if you are logged into your account! Beware you may get an email that an item is instock, but if 10 other guys have done the same thing and there are only 3 items, its first come, first serve. So don't delay in purchasing. This will happen very often with Sharpened and Balanced Props! We have setup a nice forum for people to learn and talk about rc boating. Check it out. It will be a value, even if you never post a single thing. 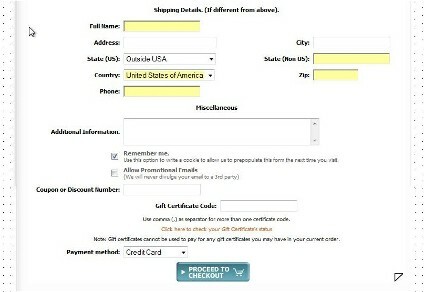 Using a coupon or gift certificate is quite simple once you know where to enter the codes. The codes are entered at the bottom of checkout page. First put all the items you would like to purchase or use the certificate for in your shopping cart. When your ready to checkout, click the checkout button. Once you get to the page where you enter your billing information, you will find a place at the bottom of that page to enter the code. Click the picture below for a picture of what that page looks like.